Corn syrup is any of a variety of forms of syrup (thick, viscous liquid, containing a large amount of dissolved sugars, with little tendency to deposit crystals) made using corn starch as a feedstock, and composed mainly of glucose. Corn syrup is a natural sweetener used in a variety of products, which may be labeled "all natural" in the United States. It is often used to soften texture, add volume, inhibit crystallization, and enhance flavor (Knehr 2005). The varieties of sweeteners listed as corn syrup differ in the amount of glucose present, among other factors (color, flavor additives, cloudiness, etc.). A commercial “corn syrup” may contain between 20 percent and 98 percent dextrose (glucose) (SA 2007). The more general term glucose syrup is often used synonymously with corn syrup, since glucose syrup is most commonly made from corn starch (SA 2007). Technically though, glucose syrup is any liquid starch hydrolysate of mono, di, and higher saccharides (ISI 2006) and can be made from starch from any source, of which wheat, rice, and potatoes are the most common sources. High fructose corn syrup (HFCS) is a variant of corn syrup in which other enzymes are used to convert some of the glucose into fructose. The resulting syrup is sweeter and more soluble. Corn syrup and HFCS address an internal aspect of people, that of joy of taste. Furthermore, carbohydrates are a fundamental component needed by living organisms, providing energy for plants, animals, and microorganisms. So important are carbohydrates to human health that a panel of experts commissioned by four United Nations agencies, the World Health Organization (WHO), and the Food and Agriculture Organization (FAO) recommended that carbohydrates should represent between 55 percent and 75 percent of the energy intake of a diet (WHO 2003). However, commercially produced sweeteners, whether cane sugar or corn syrup, have been linked to many deleterious health consequences. For such reasons, the same panel recommended that the total of free sugars (all monosaccharides and disaccharides added to foods by the manufacturer, cook, or consumer, plus sugars naturally present in honey, syrups and fruit juices) should not account for more than 10 percent of the energy intake of a healthy diet. However, people often consume an unnatural and unhealthy proportion of soft drinks and other items filled with corn syrup and HFCS, perhaps overvaluing the sensation of taste over one's state of health. A responsible lifestyle requires balance and discipline that allows one to experience the joy of creation while also promoting the natural harmony of the body. Starch is a complex carbohydrate, specifically a polysaccharide, that is used by plants as a way to store glucose. After cellulose, starch is the most abundant polysaccharide in plant cells. In pure form, starch is insoluble in cold water. Animals and plants digest starch, converting it to glucose to serve as a source of energy. Starch is a major source of carbohydrates in human diets. Hydrolysis is the term used to describe the process where starch is converted into various sweeteners. Commercially, in the case of corn starch, this involves a series of two enzymatic reactions to convert the corn starch to corn syrup (Ophardt 2003). Prior to this, the corn is processed and refined in order to separate the starch from protein and other materials, which are used for animal feed. The starch is hydrolyzed using acid, acid-enzyme, or enzyme-enzyme catalyzed processes, with the first enzyme typically alpha amylase, which produces about 10-20 percent glucose, and further treatment with the enzyme glucoamylase, which yields 93-96 percent glucose. Acid hydrolysis may involve using a weak solution of hydrochloric acid and heat to help break down the molecules of starch. The varying sweetness of the corn syrup is done according to how long the hydrolysis is allowed to proceed; the longer the hydrolysis, the sweeter the syrup. In reality, the term corn syrup refers to a group of sweeteners that differ in the amount of dextrose (glucose) present (20 to 98 percent), and that may also have caramel flavor and coloring added (dark corn syrup) or color and cloudiness removed (light corn syrup), and so froth. When corn syrup is concentrated to the point that it has less than 10 percent water, it can be listed as “corn syrup solids” (or dried glucose syrup, or glucose syrup solids, in an ingredient statement, as long as the glucose content is at least 88 percent of the weight of the concentrated syrup (SA 2007). Because of its mild sweetness, corn syrup may be used in conjunction with high intensity sweeteners. Corn syrup's major use is in commercially prepared foods as a thickener and for its moisture-retaining (humectant) properties, which keep foods moist and helps to maintain freshness. Some foods that commonly contain corn syrup are: Baking and cooking ingredients, beverages, soft drinks, breads, breakfast cereals, breakfast pastries, candy bars, condiments, cookies and cakes, cough syrups, crackers, dairy, drink mixers, frozen foods, ice creams, infant formula, jams and jellies, syrups, meats, pastries, salad dressings, sauces, snacks, soda, and microwavable soup. High fructose corn syrup (HFCS) refers to a group of corn syrups that have undergone enzymatic processing in order to increase the fructose content. This processing converts the dextrose (glucose) sugars into fructose sugars, which are sweeter. Typically, types of HFCS include HFCS 90 (most commonly used in baked goods), which is approximately 90 percent fructose and 10 percent glucose; HFCS 55 (most commonly used in soft drinks), which is approximately 55 percent fructose and 45 percent glucose; and HFCS 42 (most commonly used in sports drinks), which is approximately 42 percent fructose and 58 percent glucose. There is some controversy over the use of HFCS as a food additive. Increasingly, manufacturers are utilizing HFCS in a variety of foods such as breads, cereals, soft drinks, condiments, and so forth. The process by which HFCS is produced was first developed by Richard O. Marshall and Earl R. Kooi in 1957 (Marshall et al. 1957), and refined by Japanese researchers in the 1970s. HFCS was rapidly introduced in many processed foods and soft drinks in the United States over the period of about 1975–1985. In terms of sweetness, HFCS 55 is comparable to table sugar (sucrose) (CRA 2007). This makes it useful to manufacturers as a possible substitute for sugar in soft drinks and other processed foods. HFCS 90 is sweeter than table sugar, while HFCS 42 is not as sweet as table sugar. Cane sugar is relatively pure sucrose. Sucrose is a disaccharide, as opposed to glucose and fructose, which are monosaccharides. Each molecule of sucrose is composed of one unit each of fructose and glucose linked together with a relatively weak glycosidic bond. A molecule of sucrose (with a chemical formula of C12H22O11) can be broken down into a molecule of glucose (C6H12O6) plus a molecule of fructose (also C6H12O6. Sucrose is broken down during digestion into fructose and glucose through hydrolysis by the enzyme sucrase. Because sucrose can be broken down into fructose and glucose, some people say that sucrose is composed "50 percent glucose and 50 percent fructose." This, strictly speaking, is incorrect, because the fructose and glucose in sucrose are linked together and thus it is a different molecule. On the other hand, because sucrose is broken down in weakly acidic environments into its constituent monosaccharides, namely fructose and glucose, it is not incorrect to describe its constituents as 50 percent glucose and 50 percent fructose. This same process occurs in the stomach and in the small intestine during the digestion of sucrose into fructose and glucose. According to two published reports, sucrose is metabolized by the body like a mixture of 50 percent glucose and 50 percent fructose and no differently from HFCS (Melanson et al. 2007; FPD 2006). HFCS 50 is chemically quite similar to cane sugar as cane sugar sucrose is made of 50 percent fructose and 50 percent glucose while HFCS 55 is made of 55 percent fructose and 45 percent glucose. Both HFCS and sucrose have approximately 4 kcal per gram of solid. Honey is a mixture of different types of sugars, water, and small amounts of other compounds. Honey typically has a fructose/glucose ratio similar to HFCS 55, as well as containing some sucrose and other sugars. Honey, HFCS, and sucrose have the same number of calories, having approximately 4 kcal per gram of solid. While inexpensive alpha-amylase and glucoamylase are added directly to the slurry and used only once, the more costly glucose-isomerase is packed into columns and the sugar mixture is then passed over it, allowing it to be used repeatedly until it loses its activity. This 42–43 percent fructose glucose mixture is then subjected to a liquid chromatography step where the fructose is enriched to approximately 90 percent. The 90 percent fructose is then back-blended with 42 percent fructose to achieve a 55 percent fructose final product. Most manufacturers use carbon absorption for impurity removal. Numerous filtration, ion-exchange, and evaporation steps are also part of the overall process. The dominance of HFCS in some markets, particularly in the United States, has generated some controversies in terms of market forces and health. US sweetener consumption, 1966-2004. 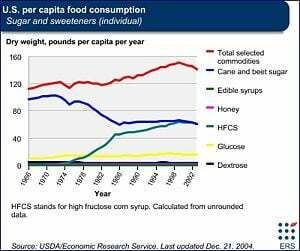 It is apparent from this graph that overall sweetener consumption, and in particular glucose-fructose mixtures, has increased since the introduction of HFCS. Thus, the proportion of fructose as a component of overall sweetener intake in the United States has increased since the early 1980s. There also are well-publicized concerns that HFCS may not be as healthy as sucrose or glucose, based on various research done on fructose, showing higher fasting plasma triacylglycerol values in men (Raatz 2000), increase of obesity in mice (Jurgens et al. 2005), and reports that large quantities of fructose stimulates the liver to produce triglycerides, promotes glycation of proteins, and induces insulin resistance (Faeh et al. 2005). Bray et al. (2004) found an association between obesity and high HFCS consumption. On the other hand, others note that such studies were on the effects of pure fructose intakes in various solutions not of HFCS and that consumption of high sugar in general would correlate with obesity and health concerns. According to research provided by Melanson et al. (2007) effects of HFCS to date mimic those of sucrose and not of pure fructose in certain individuals. High fructose corn syrup comes in different ratios of fructose and glucose, which are considered to be roughly the same products produced by the breakdown of sucrose (cane/table sugar) in the body. Melanson et al. (2006) studied the effects of HFCS and sucrose sweetened drinks on blood glucose, insulin, leptin, and ghrelin levels, and found no significant differences in any of these parameters. Of course, another issue is concern about high fructose consumption in itself, whether from HFCS or other commercially produced sources, as high fructose consumption has been linked to heart disease, raising blood levels of cholesterol and triglyceride, make blood cells more prone to clotting, diabetes, and possibly acceleration of the aging process (Challem 1995). The same concerns for health are also connected to high sucrose consumption as well. Some beverage manufacturers have returned to cane sugar as a sweetener, maintaining that there is a noticeable difference in taste. Bantle, J. P., S. K. Raatz, W. Thomas, and A. Georgopoulos. 2000. Effects of dietary fructose on plasma lipids in healthy subjects. American Journal of Clinical Nutrition 72(5): 1128-1134. Bray, G. A., S. J. Nielsen, and B. M. Popkin. 2004. Consumption of high-fructose corn syrup in beverages may play a role in the epidemic of obesity. American Journal of Clinical Nutrition 79(4): 537-543. Challem, J. 1995. Fructose: Maybe not so natural…and not so safe. The Nutrition Reporter. Retrieved July 3, 2007. Corn Refiners Association (CRA). 2007. Is HFCS sweeter than sugar?. Corn Refiners Association HFCS Facts. Retrieved July 3, 2007. Food Product Design (FPD). 2006. Similarities between HFCS and sucrose revealed. Food Product Design. Retrieved July 3, 2007. Hanover, L. M. and J. S. White. 1993. Manufacturing, composition, and applications of fructose. Am J Clin Nutr 58(suppl 5): 724S-732S. Jurgens, H. et al. 2005. Consuming fructose-sweetened beverages increases body adiposity in mice. Obesity Res 13: 1146-1156. Knehr, E. 2005. Carbohydrate sweeteners. Food Product Design. Retrieved July 3, 2007.
International Starch Institute (ISI). 2006. Starch & Sweetener Dictionary. International Starch Association. Retrieved July 3, 2007. Faeh D., K. Minehira, J. M. Schwarz, R. Periasamy, S. Park, and L. Tappy. 2005. Effect of fructose overfeeding and fish oil administration on hepatic de novo lipogenesis and insulin sensitivity in healthy men. Diabetes 54(7): 1907-1913. Marshall et al. 1957. Enzymatic conversion of d-glucose to d-fructose. Science 125(3249): 648. Melanson, K. J., L. Zukley, J. Lowndes, V. Nguyen, T. J. Angelopoulos, and J. M. Rippe. 2007. Effects of high-fructose corn syrup and sucrose consumption on circulating glucose, insulin, leptin, and ghrelin and on appetite in normal-weight women. Nutrition 23(2): 103-112. Melanson, K. et al. 2006. Eating rate and satiation. Obesity Society (NAASO) 2006 Annual Meeting, October 20-24, 2006. Hynes Convention Center, Boston, MA. Ophardt, C. E. 2003. The chemistry of corn syrup. Virtual Chembook. Retrieved July 4, 2007. Pollan, M. 2003. The way we live now: The (agri)cultural contradictions of obesity. NY Times Magazine 12 Oct. 2003. Retrieved July 3, 2007. Sugar Association (SA). 2007. Alternative carbohydrate sweeteners. Sugar Association. Retrieved July 4, 2007. White, J. S. 1992. Fructose syrup: production, properties and applications. In F. W. Schenck and R. E. Hebeda, eds, Starch Hydrolysis Products: Worldwide Technology, Production, and Applications, pp. 177-200. VCH Publishers, Inc. ISBN 1560810556. World Health Organization (WHO). 2003. WHO Technical Report, Series 916, Diet, Nutrition, and the Prevention of Chronic Diseases. World Health Organization. Is high-fructose corn syrup making us fat? It's a sticky subject (Article by Karen Gaudette, Seattle Times). This page was last modified on 23 March 2017, at 14:59.